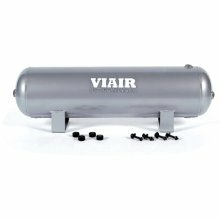 This compact 2-1/2 gallon air tank is rated at 150 PSI, is continuously welded, and internally and externally coated for corrosion resistance. With six 1/4" NPT female ports, 2 ports on each side, 1 port on the bottom, and 1 port on the top, the tank can be mounted in many positions for installation of safety valves, pressure switches, and drains without the use of costly manifolds. All mounting hardware included. 24" long x 6" diameter. Silver finish.